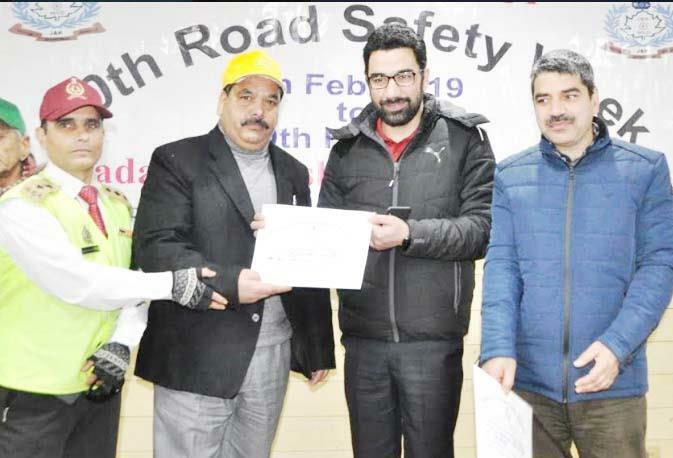 SRINAGAR, FEBRUARY 10: Regional Transport Office (RTO), Kashmir, today organized valediction of 30thRoad Safety Week themed ‘Sadak Suraksha-Jeewan Raksha’ at the Institute of Hotel Management, Rajbagh in which DC Srinagar, Dr. Syed Abid Rashid was the chief guest. The programme was organized to create awareness in public about various traffic rules and highlight the importance of safe driving to avoid accidents. Syed Abid Rashid on the occasion said that road accidents have ruined many families and consumed thousands of humans beings. He impressed upon all the stake holders to take responsibility to create awareness among the people regarding the safe driving to avoid the accidents. ‘We can have a developed society, if we will follow traffic rules and safety measures while driving vehicles’, he said. “Everything cannot be dealt with tough action and punishment, so, each of us shall have to be a responsible citizen to get rid of road accidents”, he added. Regional Transport Officer, Kashmir, Ikramulla Tak, in his speech informed about the various programmes organized by the department including rallies, free medical camps for transporters, counseling for drivers to use seat belts and bikers to use helmets. Additional Superintendent of Police, Traffic, S Dechen, Deputy Director Garages, Malik Tahir, General Manager SRTC, Mr Farhat, Presidents of various Transport Unions, Senior Citizens, members of SDRF and NGO’s were present on the occasion.